The Supersports' additional power comes from higher-capacity turbochargers and a revised intercooling system. 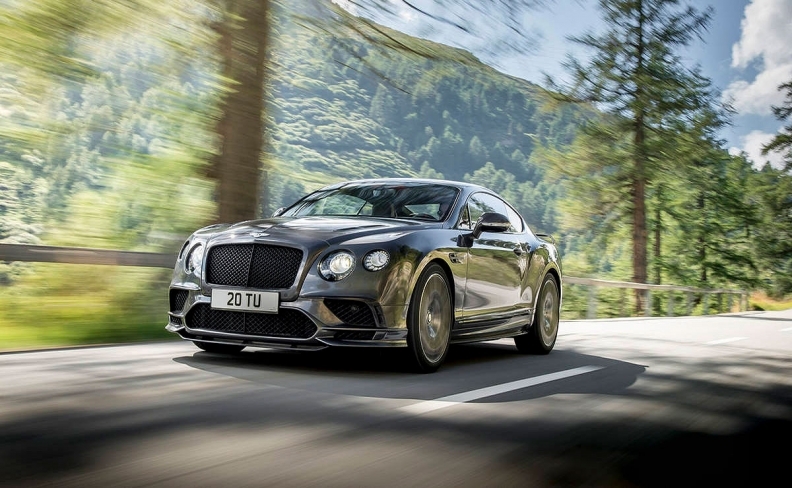 Bentley has dropped details on its latest and most powerful Continental -- the Supersports. The automaker claims it is the fastest and most powerful four-seat luxury car ever, backing those claims up with a whole lot of horsepower and torque. The 6.0-liter W12 engine makes 79 hp and 160 pounds-feet of torque more than it previously did, generating 700 hp and 750 pounds-feet in total. That's enough to push the new Continental Supersports to 60 mph in a claimed 3.4 seconds. That time stretches to 3.7 seconds with the convertible. Top speed is said to be 209 mph for the coupe and 205 for the drop-top. Braking power is provided by 16.5-inch carbon-ceramic brakes up front and 14-inch units at the rear, according to Bentley. The additional power comes from higher-capacity turbochargers and a revised intercooling system. The engine’s internals -- crankshaft and connecting-rod bearings -- have also been beefed up to handle more power. An eight-speed automatic is the only transmission available. Also, the suspension has been lowered and is now a bit stiffer -- all the better to keep you planted at 200-plus mph. Both the coupe and convertible get new front- and rear-bumper designs with a carbon-fiber splitter and diffuser, new side-sill extensions, gloss-black front wing vents and hood vents finished in carbon fiber. The Continental Supersports Convertible will offer neck warmers for top-down motoring during those cool outings. Options include a titanium exhaust system, which will shave about 10 pounds off the coupe and convertible’s 5,027- and 5,412-pound, respectively, curb weights. Bentley also offers plenty of personalization. There is an X Specification pack available that consists of eight unique duo-tone paint treatments and carbon-fiber heel plates and mirrors. Twenty-one inch forged wheels sit at all four corners. Inside, there is new dash trim, along with plenty of carbon fiber, leather and suede. Through Bentley’s vast array of available materials, the options are technically endless -- as long as your bank account is, too. Pricing and availability for the new Bentley Continental Supersports have yet to be announced. For more coverage, go to Autoweek, an affiliate of Automotive News Europe.